April 29 was a rest day and I was very glad. Somehow I did pick up a very bad cough during the last few days. The cough was at times so bad that I got dizzy while hiking or climbing. Not a good thing to have up here! The next day we moved towards the North Col and the plan was to spend one night at 7,000m/23,100ft. I felt so bad that day that I had to turn back to ABC and Charlie suggested a move all the way down to BC, something that was also in my mind. One thing was clear, this cough had to go away and it was only possible at the lowest possible altitude, and this was at Base Camp at 5,200m/17,160ft. I hiked the 22km/13,75miles down to BC in two half days with a stop in Intermediate Camp. Believed or not, while hiking down along the beautiful ice pinnacles, the ice broke while I was traversing a small ice filed and I got wet all the way up to my hips. 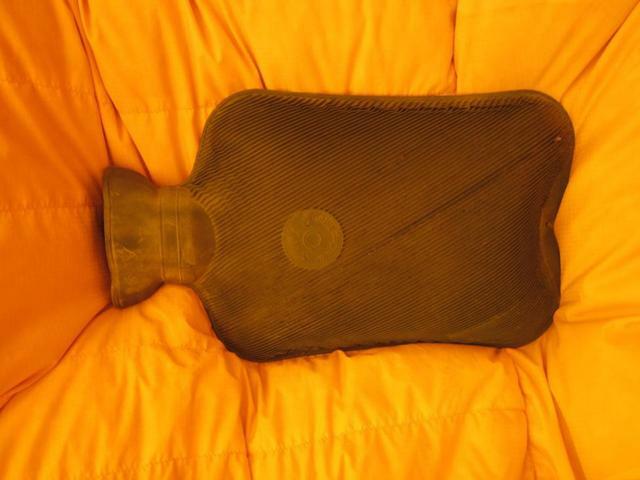 Not a good feeling to be soaking wet up to the hips while having already a very bad cough! What to do next? Well, decision making was easy: Walking as fast as possible with wet pants, socks and hiking boots to the Intermediate Camp. 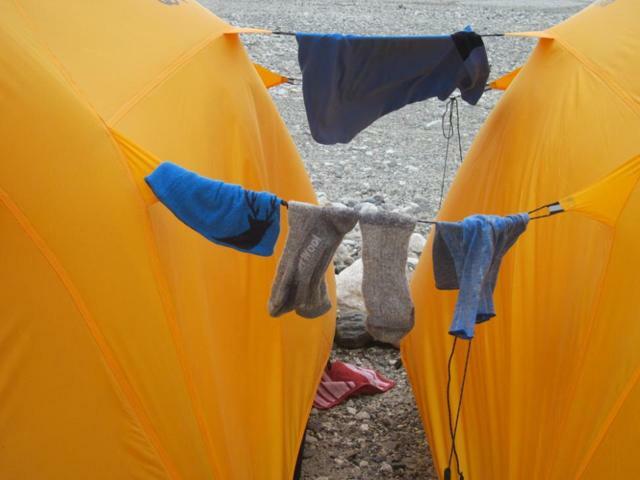 Once there, we tried to try the pants, socks and boots as much as possible near a gas stove in the kitchen and the next morning I walked with almost try equipment down to Base Camp. During this long hike I had a Tibetan kitchen boy walking with me and helping me with my bag. What a great help he was!!! Tenden, the Tibetan kitchen boy who helped me so much on the way down to BC – Without his help it would have taken me much, much longer to reach the camp! The next day I took a long shower (yes, this is possible in BC) and washed all my cloths. I also met Markus, a Swiss Doctor in BC and he helped me to put a “program” together which should help me to fight against my bad cough. I was now confident, that my cough will go away before I will move back up. What a coincidence, Markus was using the infrastructure of Kobler & Partner to later climb Choy Oyo. We had a great time together before the whole team came back shortly after because of very strong winds at ABC. I felt now much better, my bad cough seems to be gone and I am ready to move up again. However, we have now to wait for the right weather window which will come up soon. 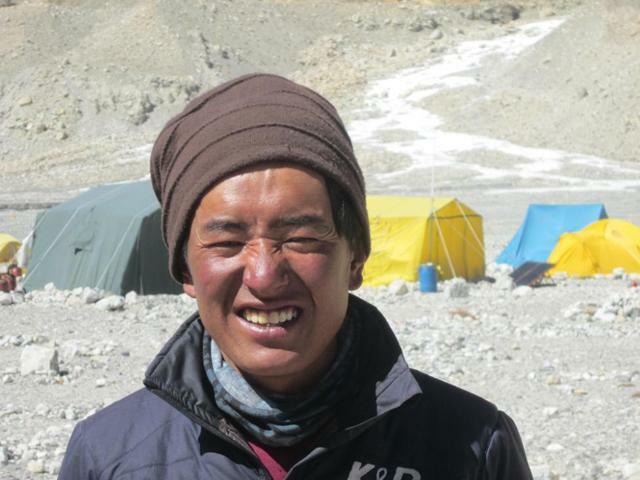 I did some reading and writing this blog, and spent time in the kitchen with the Tibetans and Sherpas. It is always interesting to see how these wonderful people live in the mountains and I have a lot of respect of them. 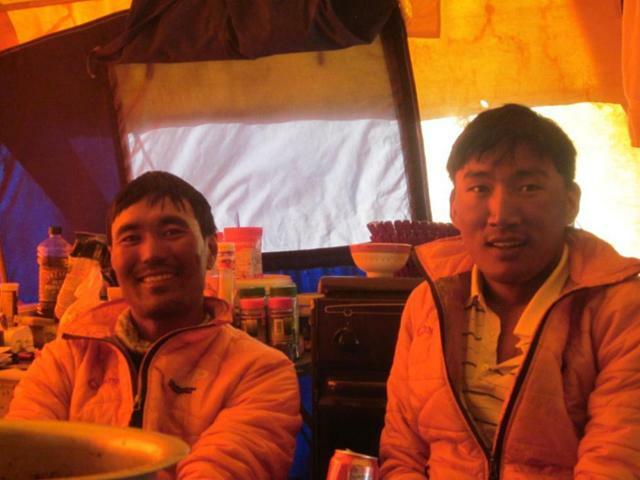 Two Sherpas relaxing after hard work done up to 8,300m/27,390ft – These wonderful people are real hard workers!!! Inhalation three times a day – This did really help me to get rid of my bad cough! 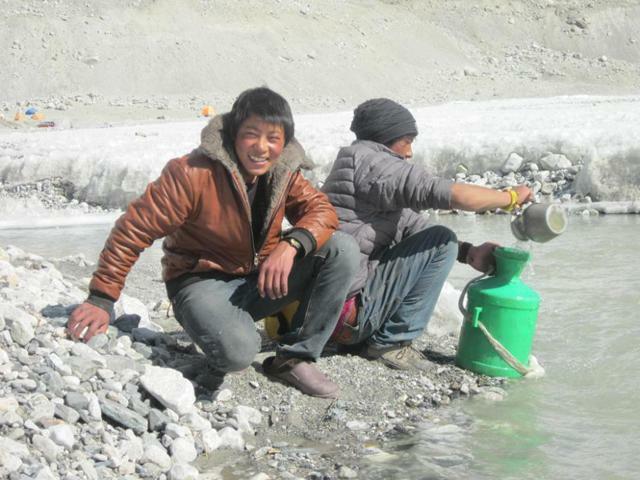 Vah Woa and Banju getting the water at BC – A lot of segments in this glacier water, but it still makes wonderful tea. 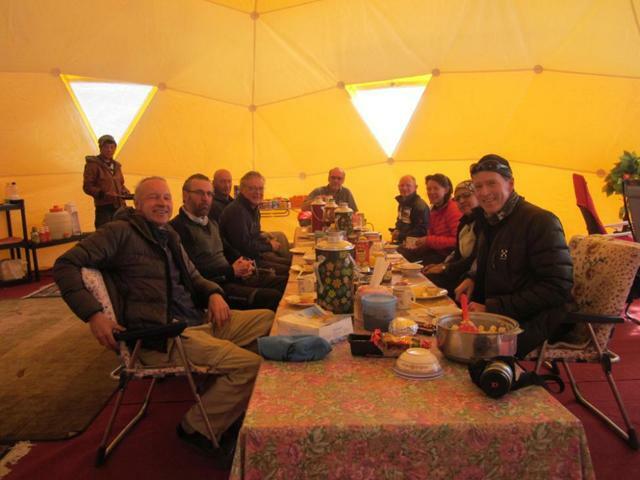 “Breakfast in the dome” – Markus, “my doctor” during this difficult time to the right and Charlie, “the boss”, in the back. I would like to mention that there has been some bad press regarding three European climbers, including Ueli Steck, the famous Swiss climber. 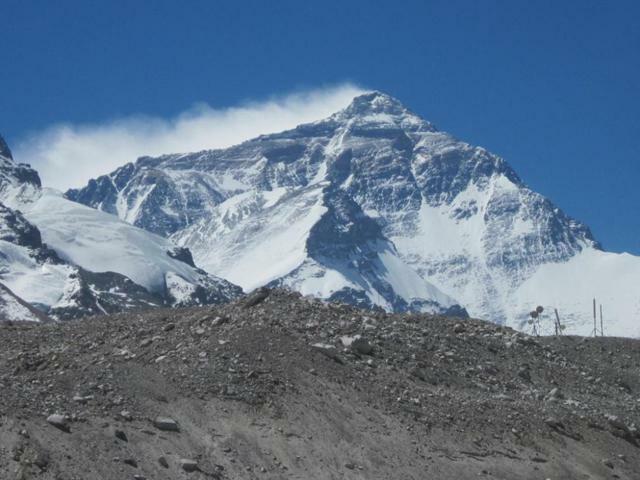 These incidents happened on the South Side of Everest. We are at the North Side in Tibet and our relationships with the Sherpas and the Tibetans are excellent. As mentioned earlier, I spent quite some time with them mostly in the kitchen during the last few days and every time I am learning something new from them: this time the way they fight against a bad cold: They boil Coca Cola and ginger: It tastes really good! Now is already May 8 and I will be leaving BC for ABC tomorrow, May 9. After this I will have very limited access to the Internet since there is no connection at ABC, at 6,400m/21,120ft. The plan is to do one more acclimatization climb above 7,000m/23,100ft and than wait for the “good” weather window for the summit climb. 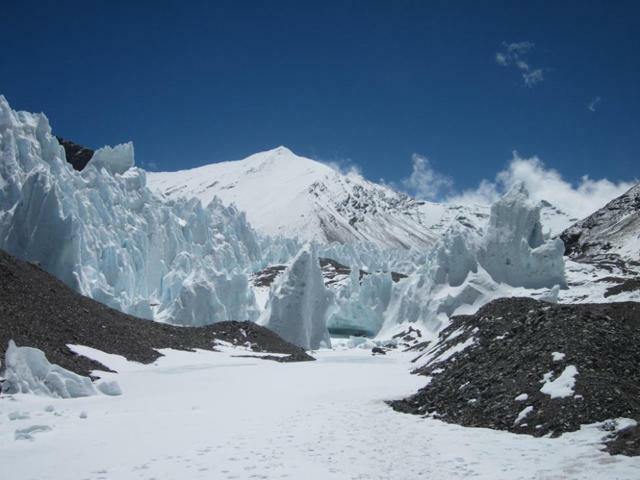 This means that we may have to stay at the Advanced Base Camp (ABC) for about 10 – 15 days. During this time I will try to send some short satellite phone updates to my blog. A detailed update will follow once we are back in BC. 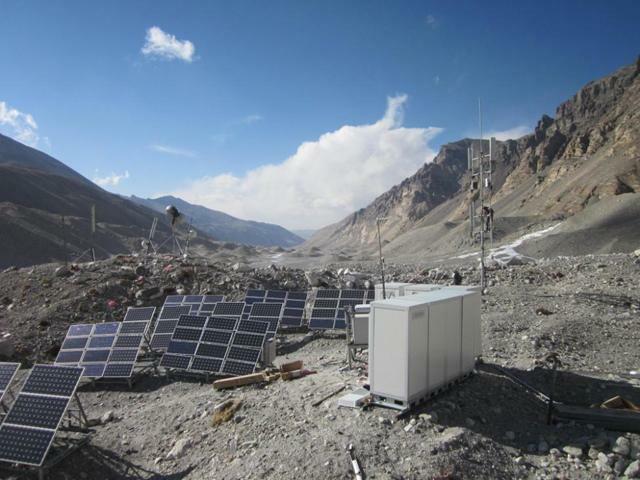 Qomolangma is still inaccessible because of very strong wind – The Jet Stream is currently moving right over it. However, the next good weather window will come before the end of May.